"I write this as a warning to the world..." headlined London's Daily Express in 1945. The story was filed by Wilfred Burchett; the first Western journalist into Hiroshima - Japan after the atomic bomb explosion on 6th August, 1945. He would go on to be an always-controversial figure, reporting from the 'other side' in the Vietnam War and further communist conflicts. What Burchett saw profoundly affected his life. In one hospital the patients wanted to kill him and he was forced to flee. Others begged him for a cure to the disease he christened 'Atomic Plague'. Burchett went on to report the communist side of the war in Vietnam, provoking such outrage in his native Australia that he was refused entry for 20 years. He finally died in 1983 in Bulgaria, spurned by the West. 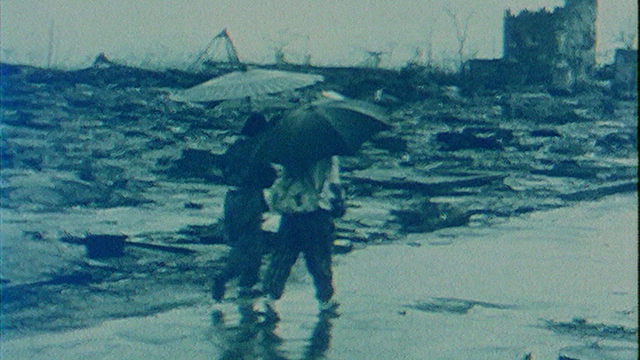 This film contains interviews and shocking archive footage of the utterly destroyed city of Hiroshima and hospitalised victims of the blast.